Expert Residential Driveway Installation and Commercial Blacktop Paving in Yardley, Bucks County, PA - Harris Blacktopping, Inc. 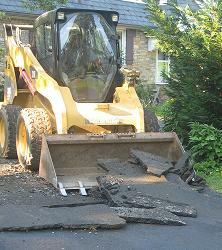 When it comes to asphalt blacktop paving, only Bucks County's finest, Harris Blacktopping, Inc, has the knowledge, equipment, and staff to perfect any paving project. This multi-generation residential and commercial paving company has been satisfying the asphalt paving needs of Bucks County, Mercer County, and the vicinity for decades. From municipal highways and roadway surfaces to residential tennis courts, driveways, and more, Harris Blacktopping has earned a solid reputation among the community. Harris Blacktopping begins the process with a free estimate by one of their professional staff members who will thoroughly evaluate your property or project, make recommendations, and prepare a proposal. On site, the Harris Blacktopping team is always respectful of the surroundings, treating the area under construction and all peripherals with the utmost of care. The crew operates state-of-the-art equipment with masterful skill. Whether that means carefully removing only specific portions of existing property or accurately laying the individual materials in just the right places without disturbing neighboring structures or landscaping, Harris Blacktopping's years of experience shine through at every stage. You can rest assured that these crews have done this many times before and will precisely create or repair the surface you imagine. You needn't be on the premises for this to take place. The crew members time the visit to coincide with a certain number of days after the project has ended. Harris Blacktopping has an unsurpassed quality standard; each blacktop contractor on the job works in conjunction with the rest of the crew to deliver outstanding results! For more information about Bucks County's premier asphalt blacktop paving company, to schedule a free consultation, or for answers to general questions, please contact us.